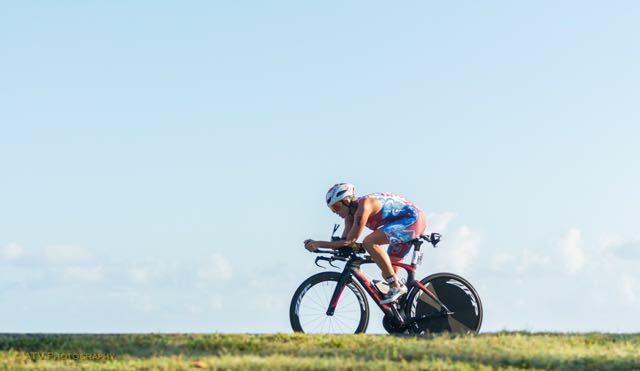 This was the second year in a row I traveled to Puerto Rico to race this event. The race course is beautiful and event is run very smoothly. It has become one of our favorites for both racing and spectating. Although my goal was to defend my title, I battled on race day and ended up in second place. Overall I am happy with my result, but leaving me hungry and teaching me lessons learned from this 70.3 distance. I used the following gear for the race: Triflare USA Beauty Race suit, Skechers GoRun4’s, Mission EnduraCool Instant Cooling Towel, HUUB SKN-1 Triathlon Swim Skin , HUUB Acute Goggles, Fuji Norcom Straight 1.1 with: Zipp Firecrest 404 tubular with Tangent SLSpeed Tires, Zipp Super-9 Disc Tubular, with Tangent SLSpeed Tires, Quarq Elsa R Power-Meter, SRAM eTap wireless components, ISM PS 1.0 saddle, Zipp Vuka Stealth base bars with ski-tip extensions, Speedfill Z4+ with the A2 Stem Mount, and the A2 system, along with the R3 system. Sampson Stratics Carbon Ti Pedals, and Rudy Project Boost 01 Helmet and Rudy Project Tryalx Orange Fluo Glasses! Race morning, I woke up excited and ready to race. For some reason, sleep eluded me the night before the race and I had very little shut eye. This is not very normal for me, as it usually does not take me four hours to fall asleep! Adrenaline is always kicking in full gear race morning and despite the early rising and lack of sleep; body is ready to go. Swim start was five minutes after the men at 6:55AM. The water was warm, around 80 degrees and the water was very calm for most of the swim. It felt as if we were swimming in a salt water swimming pool. I had a calm start, clean water from the get go and I felt very relaxed and smooth while swimming. 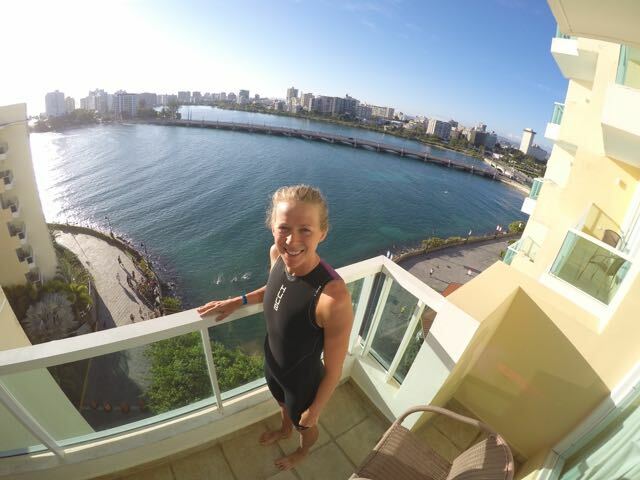 I loved my new HUUB skinsuit. There is not a string attached, but a breakaway zipper. All I have to do is flip the zipper up and pull the suit away. It’s very fast in the water, but also very easy and quick to take off. Exiting the swim, I had a two minute gap over second place. I put an extra pair of shoes for T1 since the run from swim exit to bike was 1k. The first 40k of the bike, I kept right on my watts from my previous half distance races. About three miles into the bike, I lost a bottle, meaning I would have to pick up another later in the race. At 40k, Tine Deckers passed me and I began to ride with her. The pace was just slightly more watts than I was doing before, but I had the advantage of seeing someone right in front of me, which makes riding mentally and physically easier! 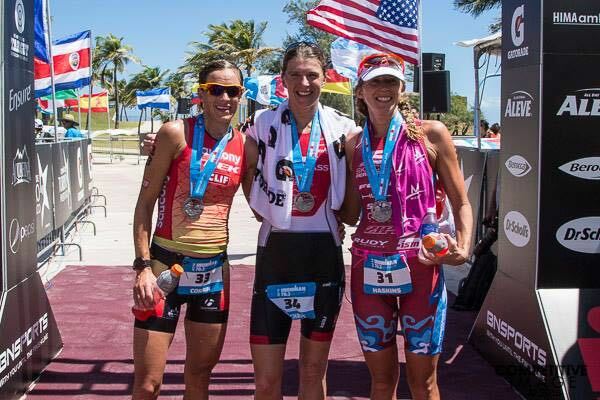 Once we merged with the age groupers, it became much, much harder to stick with Tine. I had to push close to 40k watts (although I wasn’t looking down much at my power). I was able to ride with her for another ten miles, but then I lost her towards the end of the loop with about 12 miles to go. The last 10 miles, my legs completely fell off and it was a rough ride back to transition; both mentally and physically. For some reason my power screen went dead over a bump and I did not have any power to go off of, which is my “go to” at the end of 1/2 IM bike races to keep pushing. I lost 3:30 the last 12 miles of the bike, and that was just way too much time to lose over that distance. I felt very fatigued coming off the bike and had a 3:40 deficit to Tine. With the weather being so warm and the run course being so challenging, I focused on my pace, getting hydration and getting into a groove over the course of the next few miles. I was putting some time into her and half way through the time cut was down to 1:55. I continued to push, but it was not enough in the end. With a mile to go, I had cut back the time to just over a minute, but at this point I went into cruise mode and focused on getting to the finish line. This run felt much warmer than last year, but overall I felt good on the run until the last mile. I grabbed as much as I could at every aid station to try and stay cool. 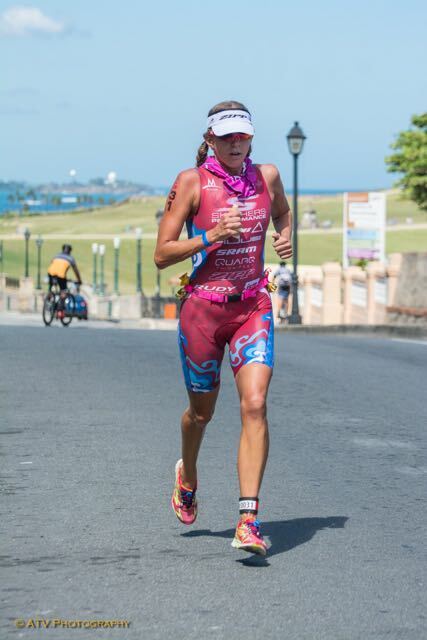 Linsey Corbin also had a great race and finished just behind me in third place. Congratulations to all the racers who finished on this beautiful, but brutal course. 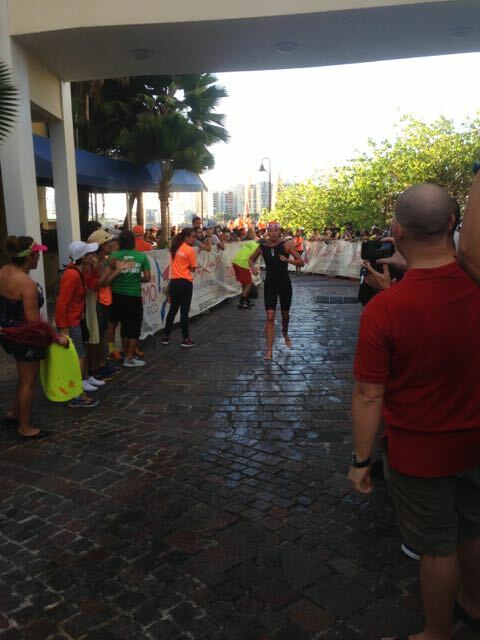 I was amazed by a 79 year old age grouper finishing this course just under 8 hours! After the race it was nice to relax by the ocean and enjoy the beauty Puerto Rico had to offer. Hard to believe this was my third race already this season. Excited for the next one just around the corner. Thank you to all my family, friends and amazing sponsors for your support.